TUMEKE! : Earth to the Labour Party - where are you Labour Party? Earth to the Labour Party - where are you Labour Party? Put in perspective, the equivalence of Labour's spectacular silence on the Ports of Auckland privatization and Union crushing agenda would be National having nothing to say about implementing every single word of Karl Marx's, 'Economic and Philosophical Manuscripts of 1844', 'Wage Labour and Capital' and 'A Contribution to the Critique of Political Economy' all within a one month policy roll out codenamed kill-the-filthy-farmer-swine. There was a fear that when the right wing faction of the Labour Party gave David Shearer the numbers to beat Cunliffe for the leadership (as described by Fran O'Sullivan) that Shearer would not be his own man with that political faction chip on his shoulder. That fear may be well founded. With welfare reform reading lists that makes Tony Blair's 3rd way look principled, it seems that perhaps David's political advisors want to grow his pie, not by exciting the passions of the nearly one million enrolled voters who didn't bother to vote, but by simply fighting National for their voters. That's a pretty stupid way to grow a pie. By sinking into a party that merely manages redneck NZ rather than challenge it, why would anyone bother voting for Labour? You are fond of telling us, Mr Shearer, about that transformative moment in the Sudan when you looked over the side of the truck you were travelling in and witnessed half-starved children scrabbling in the dust for the scraps of food you had casually tossed away. It’s an arresting image: redolent with all the sub-texts of injustice, wealth and poverty, and the inevitable conflicts to which scarcity gives rise. And the clear implication of your story is that not only did you perceive the intrinsic moral squalor of the scene being enacted in the fly-blown Sudan dust, but that you decided then and there to do something about it. 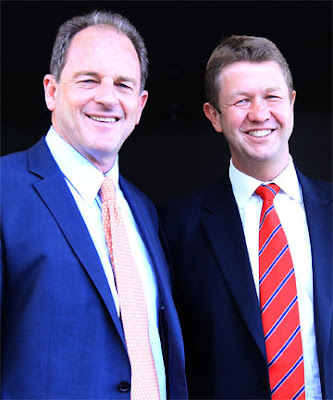 ...Shearer was picked as leader because his none political back story could disarm Key's none political back story, yet the sense of morality that made Shearer leadership material is utterly lacking as the Ports of Auckland set up an unethical attack on unionized workers. What David's advisors seem to fear is Brand Shearer being linked to 'old labour' by having him rush to the defense of the Union, that shallow expediency avoids the fact that what is being proposed by Ports of Auckland has all the ethics of burning puppies alive. What the Ports of Auckland attempt to crush unionized workers actually represents is the low wage economy National have managed to degrade NZ down to, PoA CEO Tony Gibson takes home over $750 000 yet wants to chop 320 workers pay by $20 000 to save $6 million? As the ever brilliant Rod Oram reading deeper into the Productivity Report points out, the real reason our exports are being hurt via our ports is the much higher freight costs the shipping lines themselves charge. A shipping container from Auckland to Singapore costs $1553 while it cost only $486 from Sydney, as Oram concludes, "shipping costs dwarf whatever productivity gains the ports can achieve so the government must investigate them. If it refuses to do so, yet it heaps pressure on council-owned port companies and their unions to eke out efficiency gains, the government, quite simply would be acting uneconomically and, worse, immorally." That Labour are so silent on an issue of social justice as clear cut as this dispute suggests that Team Shearer are simply hoping for National to just lose 2014 by John Key accidentally choking to death on a pretzel, or it suggests Labour's strategists aren't bothering to excite apathetic voters and are moving to the right to try and win National Party voters. Either answer is depressing for educated NZers. Shearer needs a strategy and needs one fast otherwise David Cunliffe will be starting up BBQ sessions this summer. Dear Bomber, history tells us that ineffectual parties like Labour cannot survive when sovereign states like ours & other Western countries cease their ridiculous flirtations with union-inspired political principles & return to the beliefs of the pre-WW2 past. At last it is slowly becoming de rigour to support ideologies that have for many decades been unfairly vilified by the uninformed masses & a left-leaning press. The greatest democracy in the world is leading the way as Republican presidential candidates are falling over themselves to prove to the American public that they are the legitimate heirs to the noble, fascist states of the 1930s. As each week goes past, the GOP nominees have almost memorised the entire texts of Nuremburg rally speeches and modernised the tried & true content which was so effective over 80 years ago. Hatred of Jews has been replaced with legitimate hatred of Moslems (anti-Semitism in the 21st century), the threat of Bolshevism has been replaced with fears of creeping socialism and/or communism (ditto Adolf) and the financial support of business corporates has been assured to replace any irrational debate with easily understood analysis. Obama has almost curtailed those silly laws protecting individuals from state oppression, which makes it easier for both parties (Democrat or Republican) to concentrate their efforts on stabilising the economy and renewing the basic values of hard-work and patriotism that the Germans and Italians appreciated so well. While the witch-hunts of the McCarthy era generally concentrated on the weeding out of communist sympathisers, the new era in US politics has declared war on just about everybody, including non-Christians, gays, racial minorities and advocates of contraception. In a scene so reminiscent of the Third Reich, Newt Gringrich received a standing ovation for exhorting his audience to kill America’s enemies & do away with any basic legalities to protect said enemies’ redress to justice – I’m sure he was almost overcome with the urge to raise his right-arm in the extended, anterior position. The political hue of the residential race has also taken a new & sensible turn with a renewed critique of the poor. Mitt Romney now praises the McDonald Burger chain as the epitome of good business, thus promoting sensible wage structures & more employer influence over employees as the way forward. NZers have shown their support of some fascist ideals by voting for John Key, but we can do better with enhanced, more coordinated attacks on the lazy and under-employed & pass more laws to prevent people like Metiria Turei & her people from gaining parliamentary power. NZers must continue their support of National who must strive even harder to control the unruly masses & keep the NZ the way it was meant to be. As a starter, Norfolk Island could easily be re-commissioned as a detention venue. The ‘God of nations’ we entreat is alive & well in the ‘land of our fathers’ – we should take note & give Labour a belated farewell. Labour's inability to support workers - their own constituents - will mean that Mana will fill the vacuum.